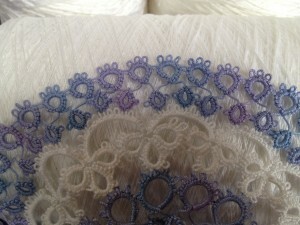 Snapdragon Lace » New Doily! New Threads! So Much NEW! New Doily! New Threads! So Much NEW! I have been super busy this last month with my new job, with taxes for my accounting clients and with lots and lots of new thread dyeing. Here is the first few rounds of a new doily from Priscilla Tatting Book #1. I’ve been really focused on the first book since I’ve decided to publish my patterns in the same order that they are in the original books. There’s another couple rounds left on this doily, but this was all that I could get out of the little mini-skien that I dyed in this batch, so the rest will be white. I make mini-skeins for myself out of the leftovers from winding the 50 yard skeins that are for sale. This one I’ve named Wisteria and it’s available in my Etsy shop. It’s exactly the soft color change I’m going for with my HDT and I had a good time tatting with it. Over the weekend I finally went through and got all my new threads listed. Well, all of them except for the few that were still drying. I have plans to do some more dyeing tonight, but we’ll see how my time goes. Things have been so busy that I’ve basically just made a list and am getting to whatever I get to, but not trying to actually predict anything. Let’s see… What else is new? Mostly it’s the thread dyeing, but the other big thing is getting ready for Shuttlebirds. Yesterday I finished up the instructions for the carnation hair clips, so I just have one left to do and then I’m ready for my classes. Patti wants the instructions by the 28th so I should have it wrapped up by then. 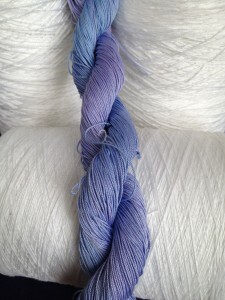 The thread dyeing is a large part of getting ready for Shuttlebirds too, since I’m planning on selling there too. I’m teaching this weekend at the Lacemakers of Puget Sound meeting too, so I’ve got to take some time to get ready for that. I’m going to be teaching split rings and beaded split rings. I’ll be teaching projects that I’ve taught before so the patterns are ready, I just need to get around to getting them printed out and double check that my teaching kit is in good order. Nothing that will take long, but I’ve just got to sit down and do it! That’s been a lot of my life lately. Things that I’m super excited about and things that are mostly not too complicated to do. Just need to get around to doing them. And I only demonstrate and don’t teach classes at our events. Teaching a group would stress me out! And I can’t even imagine dyeing threads! That’s way too complicated for me! Your doily is looking great! If you see Mary McCarthy, please let her know I am grateful for all her patterns from various magazines back when I was learning to tat in the early ’90s. They have become favorites. Your doily is wonderful, congratulations! Kathy, I’m a big fan of Mary McCarthy and all she did to help keep the older patterns in circulation. If I see her, I’ll tell her! 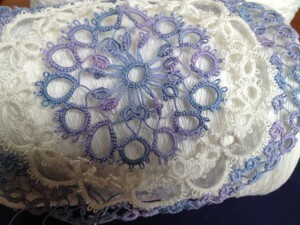 The doily is looking beautiful, love the thread you dyed…beautiful colors. We recently moved from Colorado to Vashon Island in the Puget Sound so I am very curious about the Puget Sound lace makers? Wondering if that is something I could get to! Could you tell me about it or direct me to a website? I would love to go to Shuttlebirds, but it falls on my 4 year old daughter’s Birthday weekend (the 25th of April is her 5th Birthday) and I am feeling kind of like that might be on the selfish side for me to go this year…though the desire to go almost overrides that! Thanks for the nice note! Shuttlebirds is worth it if you can make it, but I can see how the timing would be hard. You should definitely check out Lacemakers of Puget Sound. Their next meeting will be the same weekend as Shuttlebirds next month, so I (and a few other tatters) won’t be there, but it’s a great group and I know a few other tatters who can’t make it to Shuttlebirds will still be there. Their main meetings in Kent are monthly, but there’s also two other related groups that meet monthly as well. One in Everett which always has tatters and one in Bellevue which sometimes does. The Bellevue one meets next on the first Saturday of April at the Crossroads mall. I’m going to try to make it to that one, though I’m not sure if I will yet. Thanks Fox! It’s my most popular color so far. The size 20 has sold out and there’s only two skeins left of the size 10. I think I’ll have to try to make some more, but I’m not sure how well I’ll be able to replicate it. Rainbow Tea Cloth Center is DONE!